A McLaughlin automobile and horse-drawn carriage on a busy street. Collection of the Canadian Automotive Museum. Independent Canadian companies were highly successful in the early years of the automobile. Early firms were originally carriage companies and produced the “horseless carriage”—a carriage with an engine. As part of the British Empire, Canada benefited from a protectionist tax, which allowed Canadian auto companies to export vehicles to all countries within the Empire at a lower tariff rate. The Tudhope Carriage Company of Orillia, Ontario. Orillia Public Library, OR_423. This success lasted only until the Great Depression of the 1930s brought an economic downturn. Canadian automobile companies did not have the financial capacity to survive the crisis and could not compete with the much larger U.S. plants. As a result, American companies began to dominate the Canadian automobile sector. The 1908 Tudhope-McIntyre was produced in Orillia, Ontario. In 1908 Tudhope Carriage Company formed a partnership with W.H. McIntyre of Indiana to produce automobiles using McIntyre’s mechanical parts. The assembly line at the McLaughlin factory in Oshawa, Ontario, 1908. Thomas Bouckley Collection 0713, Robert McLaughlin Gallery. In 1904 the Ford Motor Company of Canada was established in Windsor, Ontario. The Chrysler Corporation of Canada was also established in Windsor due to the city’s proximity to its successful U.S. counterpart in Michigan. The McLaughlin Motor Car Company, headed by R.S. McLaughlin, was established in Oshawa, Ontario, in 1907 after first operating as a carriage company. It later merged with the Chevrolet Car Company of Canada to become General Motors of Canada. When galloping, a horse can reach speeds of up to 48 km an hour. The 1908 Tudhope-McIntyre could travel at the same speed. Which would you choose? 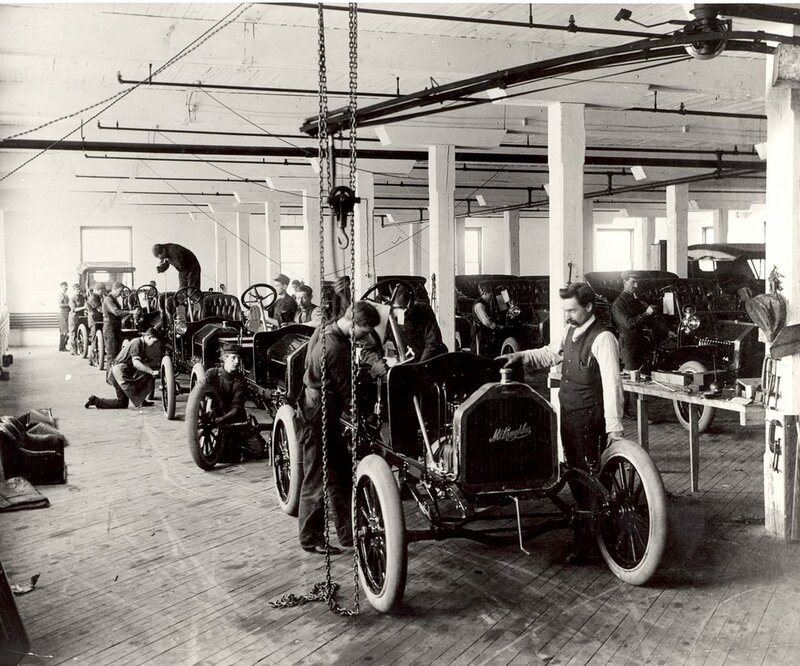 American companies established automobile factories in Canada to gain access to the Canadian market and to bypass high import tariffs. The industry boomed in the 1950s due to postwar economic prosperity and consumer demand. The museum has examples of these Canadian-built cars—including the 1950 Oldsmobile, 1955 Buick Special, and 1966 Buick Wildcat—many of them produced nearby at the General Motors plant in Oshawa. Promotional image of a Meteor, 1959. Collection of the Canadian Automotive Museum. Studebakers were produced in Hamilton, Ontario, from 1948 to 1966. Studebaker brochure, 1954. Collection of the Canadian Automotive Museum. Many of the automobiles produced in Canada were modified versions of U.S. models designed for the smaller Canadian market. These “Canadianized” vehicles were advertised as being essential to a Canadian lifestyle featuring family road trips and winter adventures. The Auto Pact, established in 1965, allowed cars and car parts to move freely, without taxation, between Canada and the United States. The agreement enabled Canadian automobile branches to produce vehicles for all of North America, greatly increasing the prosperity of the industry in Canada. The pact, however, ended the production of uniquely Canadian cars. After the Auto Pact was signed, Canadian automotive exports increased. In 1967 Canada exported 243,206 vehicles to the United States. South Africa, Venezuela, and Peru also chose to import Canadian-made automobiles. The most popular automobile imports to Canada in that same year came from the United States, United Kingdom, Germany, Japan, France, and Sweden. Although the pact was dissolved in 2001, the automobile trade remains one of Canada’s most important manufacturing industries. Signing of the Canada-U.S. Auto Pact at Lyndon B. Johnson’s ranch, Johnson City, Texas, on January 15, 1965. Library and Archives Canada, PA-139787. A modern Toyota consists of over 30,000 parts. That number includes the steering wheel and headlights, and even the nuts, bolts, and screws that hold everything together!